Looking for getting hold of Lionel Messi's Barca Jersey. Find some of the greatest deals available below. The best collections of Lionel Messi Barca Home and Away Uniforms. Should Barca Make a Bid for Oriol Romeu in January? So much have changed for Barca this season, especially at the midfield. The midfield which was once the source of everything good at Barca have suddenly turned into a quagmire. With Iniesta's absence it has practically become non-existent; prompting questions whether it was wise to let Xavi leave rather than keeping him still the midfield transition was on-going. It wasn't anything like this last season; the trio of Rakitic, Iniesta and Busquets was solid behind the fearsome front trio. Then what changed this season - the answer is pretty simple and clear for everyone - Sergio Busquets. 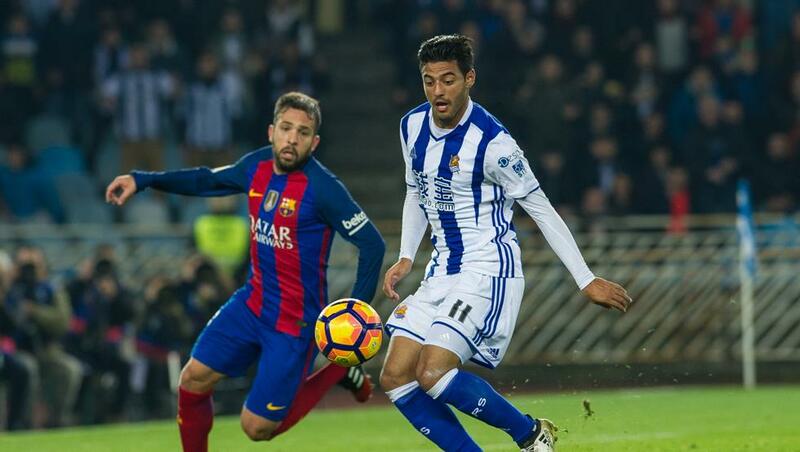 The Spanish midfielder, whose place in starting eleven was never a point of discussion suddenly has become the weak-link (Sergio Busquets form is Worrying Everone at Barca). Add to that the fact that Rakitic is a completely different kind of midfielder compared to Xavi; we have a practically non-existent midfield in the absence of Iniesta. Watch the highlights from Barca's 1-1 draw against Real Soceidad. This one is gonna be tough. This was nothing short of "The Great Escape" act by Houdini courtesy of the linesman. There is no other explanation of how we ended up from the trip to Anoeta with a point not with a destruction in terms of result. One may have to look at the upcoming Clasico to see whether the Great Escape Act actually helped or the gruesome experience of Yesternight has left a huge psychological scar on them. Regardless of all these with this draw Barca find themselves six points behind league leaders heading into the Clasico. Which makes that a must win game now. Usually when we fail in a match we as fans are used to holding on to any positives you could find. Hours have passed after the match I am still looking for one, the closest I got is that we had officially 47.7% of possession. For some reason as a person who watched this match; I can't get my head around that number - we barely had a possession and 47.7% of it; no way! Celtic may feel they are hard done with the timing of this clash. After the 7-0 drubbing away at Camp Nou in the first match of the group, Celtic may have been hoping for a bit easier life when Barcelona football club comes visiting. But this could be quite tricky as Barca will be attempting to correct the slip ups they had both in La Liga and UEFA Champions League. It's all stacked up against Celtic at the moment - Barca had a drubbing at the hands of Manchester City in the last match in the Group; topping the group also will be a risk if they slip up against Celtic; the slip up in La Liga this weekend would demand a perfect answer from the Catalonia side; Messi who has scored in all matches in which he has played in Europe so far, who is the leading scorer in Champions League this season, he definitely wants to continue that start and he is also frustrated not to have played in the weekend; that means he is rested, so is Luis Saurez - the odds are stacked pretty badly against Celtic. Barcelona Futball Club would be looking to pile the pressure on Real Madrid and also Atletico Madrid when Malaga visits Camp Nou this Saturday. The clash between FC Barcelona and Malaga takes place four hours before the Madrid derby at Vicente Calderón stadium. A victory over Malaga will take Barca to the top of the League, may be temporarily; but it should put immense pressure on current league leaders who will be visiting the cross city rivals. Real Madrid who has not been exactly on fire should have enough to worry with their visit to Atlecto's stadium; we could just add to that with a good result against Malaga. As per the current La Liga odds FC Barcelona is favourite to defend their title amid not so great Home performances this season. This is mainly because other title contenders ain't igniting the stage on fire either. Lionel Messi inspired Barca made a wonderful comeback at the Sanchez Pizjuan stadium against home side Sevilla. Lionel Messi scored the equalizer after going down 1-0 early in the match and assisted the winner from Luis Saurez. The second half performance by Barca and especially Messi was one of the brilliant performance this season especially in a Stadium whcih has been a head-ache for all the team to travel for sometime. This was Sevilla's first home defeat of the season and if last season is a benchmark; that' a heck of achievement. Watch the Extended Highlights with English commentary below. Barca's disastrous performance at the Etihad Stadium last night may be considered a one-off; definitely that's the solace their Manager holding on to. But looking back at a series of performance we may find a bigger problem hidden in all these performances. One might wonder which are those performances; especially looking at Barcelona's recent performances. But even in those tricky results and sensational performances, there were enough signs of last night's debacle waiting to happen. The explosive trio upfront had created an incredible sense of aura which makes these small crack invisible at times. The score line of 3-1 of last night may not give the apt picture; Manchester City dominated us completely for most of the game and our defense were put on relentless pressure. But for me as usual when Barca gets dominated then there is only one element which is at fault - Midfield.